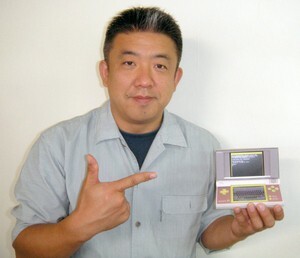 Petit Computer arrived on North American DSiWare in mid-July, and since that time a number of enthusiastic programmers have no doubt been getting accustomed to the BASIC coding language. The app has already had a positive impact in Japan, with an enthusiastic community that has been producing and sharing innovative games on the humble DSi for a number of months. Now that Petit Computer has branched out of Japan, we spoke to Kobayashi-san, CEO of SmileBoom Co., Ltd, to learn more about its development and why BASIC still matters. How would you describe Petit Computer in simple terms to someone who was unfamiliar with the concept? To put it very simply, it is a version of the programming language known as BASIC. It enables users to program their own unique games and tools with the minimum of fuss. I think that when compared to standard game development software, the big difference with Petit Computer is that it allows you to come up with completely original concepts, starting entirely from scratch. I think that the fact that it utilizes the power and portability of the Nintendo DSi and 3DS really sets it apart as a uniquely high-spec BASIC program. What was the initial inspiration behind this software? And what made you decide to use BASIC? Well, I am part of the generation that grew up in the 1980s, and BASIC was the way that we learned to program. I think that was true of all young people who had an interest in technology at the time. Of course, for those of us who went on to program professionally, we needed to learn more sophisticated programming languages and development tools. But there was a real appeal to the simplicity and intuitiveness to BASIC, in the way that you could see your programs executed right away. That’s something that really stays with you. So this project began with our desire to use BASIC again, and we decided that if such a program wasn’t readily available, we would have to come up with one ourselves. There was an element of nostalgia for our youth, while at the same time, we felt that a BASIC tool would serve as a useful introduction to the world of programming for users who had no experience of using it. What do you think makes BASIC suitable as a programming language for DSiWare? Well, it might seem rather counter-intuitive, but we actually thought that the type of consumer electronic device most suited to a revival of BASIC would be a handheld console. I think that our experience of pocket computers in the 80s and admiration for those devices also led us to this conclusion. But the primary reason for us was that we thought a handheld console would serve as the ideal platform in terms of the ease of use of BASIC. The simplicity of being able to take your console out of your bag, open the lid, and continue working on a program was something that was very important. The reason we decided to make this program as DSiWare was that we had become familiar with working with Nintendo DS hardware, and because it was a way to make the program available to a broad consumer base at an affordable price. How important was it to you to use QR Codes to allow users to easily exchange programs? 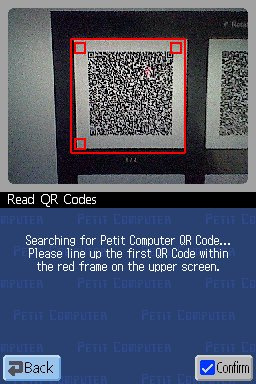 We originally released a retail version of this software in Japan which did not include the QR Code function. This meant that in order to exchange programs, users would have to actually meet and swap data via local wireless communication. The feedback we got from a lot of users was that they were very keen to share programs with a much broader spectrum of users. I think that in the internet era, this desire to be able to share is completely understandable. Of course, there was one other extremely time-consuming way to exchange programs, and that was to take a photograph or video of the program, and for other users to then enter the whole of what might be an extremely long source code themselves. Now, the generation that grew up in the 80s can remember copying code from specialist programming magazines, and so this approach actually holds a certain appeal. But in the end, in response to the clear demands of our users, we put out a version in Japan which included the QR Code function, and the response we got was extremely positive. We saw a community of users grow extremely rapidly, with the internet serving to break down any sense of distance or barriers between them. We see it as a major success that the active user communities we had hoped for have actually developed. Now, with the release of Petit Computer, we look forward to new users from all over the world getting together and communicating with each other. Now that this title is available in North America, are there any plans to release it in Europe? We never wanted Petit Computer to be limited to just Japan and America, and we would like to see it being used all over the world. But to achieve that, we will have to deal with issues such as localization into a range of different languages. We hope that we will be able to realize our hopes and meet the expectations of the many users we think would be interested in this software. Why did you originally decide to release this software in North America? We didn’t want the experience of Petit Computer, the fun of rediscovering BASIC, and the programming knowledge that can be learned through it, to be limited to Japanese users. We wanted this to be shared by users all over the world. We believe that by making this title available in America, this will be the first step in broadening the global base of users who will enjoy Petit Computer. Petit Computer has been a great success in Japan. Which user-created programs have you particularly enjoyed? I’m not sure if I’m allowed to say ‘all of them’. I have seen a whole range of programs, from games that professional programmers in the industry have poured their heart and soul into, all the way to the very first programs that elementary school students have created. Although we all made full use of our own programming skills to create this software, we are still left wondering how users managed to come up with a program. At the same time, classic BASIC programs have a really nostalgic feel, and when I see the ideas and humor in a lot of these programs, I can recognize a kindred spirit at work, and leave comments saying how much I liked a particular program. It also makes me smile to see what beginners who have not yet mastered programming come up with, as I can recognize my younger self in those programs. It really means a lot to me that all of these people have become interested in programming via our software. Do you have any plans to let users share or develop programs via the Petit Computer website? Well, in Japan, communities of users have come together to organize things like their own programming contests. If this is something that users are interested in, we would very much like to attempt something like this on a global scale. Do you have any plans to develop versions of Petit Computer using other programming languages? There are a large number of programming languages out there. I would say that if a user is introduced to the pleasure of programming through our software, I would encourage them to continue and pursue one of the many options that are out there. How is the future looking for Petit Computer? First of all, I am really excited at the prospect of the user community expanding. The QR Codes in the program can be shared throughout the world, meaning that users in American can enjoy programs created in Japan. I am really looking forward to seeing what programs American users can come up with. I think it will be incredibly interesting to see ideas for programs that Japanese users might never have thought of. ...this is just the beginning for Petit Computer. Our vision is that it will expand throughout the world and allow everyone to discover the fun of programming, regardless of their age or where they come from. We will continue to strive to make this vision a reality. We have already had a lot of requests for new functions people would like to see added to the software, as well as countries people would like to see it released in. These kinds of business decisions are complex, and I can’t really comment on them here, but I know that this is just the beginning for Petit Computer. Our vision is that it will expand throughout the world and allow everyone to discover the fun of programming, regardless of their age or where they come from. We will continue to strive to make this vision a reality. Could you explain to people who perhaps aren’t overly knowledgeable about BASIC how it first came about? If we were to recommend that people look it up on the internet, it really wouldn’t communicate the great affection we all feel for BASIC. So though it’s rather a rough outline, I would say that the home computer boom of the 80s served to popularize BASIC. The majority of computers at the time would have come with BASIC installed as standard. Those who have some knowledge of the history of home computers will recall that the Apple II came with an in-built BASIC program. When you switched on the Apple II Plus, BASIC would be launched, which I think makes clear how prevalent BASIC had become at the time. Of course, you could simply load programs you had purchased and enjoy home computing that way. But at the time, one of the pleasures of home computing was learning how to program with BASIC. While it was just a hobby for some people, others took it to a much more serious level, and there are a huge number of programmers today who got started on BASIC. A range of object-oriented programing languages subsequently came to dominate the field, and BASIC is now a relatively minor programming language. But I think that over the course of the last couple of decades, software development has gradually abandoned the kind of simplicity and accessibility that BASIC had. I think that if you judge BASIC by today’s standards, it is lacking a certain elegance in terms of its design. But at the same time, it offers the user a great deal of freedom when compared to commercially-available construction tools, and allows the user to express themselves in a simpler, more intuitive way than with the main development set-ups you find nowadays. We'd like to thank Kobayashi-san for his time, and if you want to know more about this innovative app check out our Petit Computer review. Does it really need localization? I'm fairly sure any european smart enough to use this knows enough english. Can't wait to get my hands on this thing. I have so many ideas but very little experience so I have to start with smaller programs but I hope I can someday make some better games using Petit Computer. I also want to try all the games others have made. @amjh You're right. I hope this comes to EU! I have £9 left on my eshop account to download this game so I really hope it comes to Europe. I really really want this to come to Europe too, I will definitely buy it on the day of release! It's weird that it hasn't yet because Gamebridge usually always publishes in Europe. And I agree - it probably doesn't need much localisation. I think BASIC uses English in any language anyway, only the instructions will need to be translated. just release the english version for europe. dont you need english to program in BASIC since all the orders are written in english? sweet, can't wait to try it. totally worth 8 bucks. Now I just need a few free days to stay up and learn it the hard way. I had only used BASIC once in the past, as an introduction to programming, and even then it was considered too outdated. 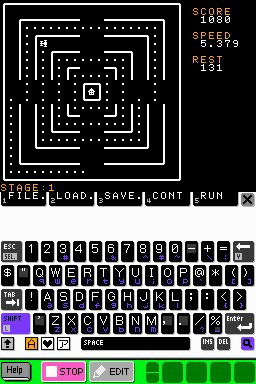 I love petit computer, it became the most played game in my 3DS in just a few days, thanks a lot for releasing it here! I have no idea whatsoever when it comes to programming, but this app has me terribly interested! Kobayashi-san, if you're reading any of these replies, thank you for answering our questions. 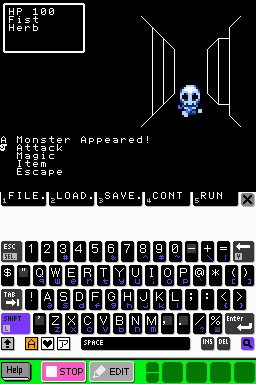 I admire that you want to bring Petit Computer to the masses, it really takes me back to my younger days puttering around with old Apple II machines and the like, but I think the single best thing you can possibly do for this app is to release some sort of tutorial or a fully fleshed out manual to help your potential fanbase be that much more broad. There are people out there with great ideas but very little knowledge of BASIC, and there are no real SmileBASIC tutorials out there. It's different enough from other flavors of BASIC to be problematic for budding programmers. i had a helluva time figuring out how to get around the lack of an INT command. Thank goodness someone had mentioned that SmileBASIC was floating-point in the review thread; after some digging via Google I believe it was a Perl tutorial that eventually gave me the connection to the 'floor' command. Downloaded this app only too have NOTHING explained to me. Seems usefull but useless to anyone who hasn't used BASIC before. Which most haven't. I'm eager but feeling HOPELESS! @amjh For instance in countries that speak English such as Britain and Australia the word would be localisation. But the changes will probably be small, only docs would have to change, the BASIC language would be the same. @JKCB97 There is an extensive help section that has instructions on how to use the app and even has sample programs and how to run them. It also tells you how to view the code for the many sample programs that are included. I had never used BASIC before either, but I feel that game me a good start. There is one thing that I don't understand about this game. Is there any tutorial? Meaning, can you play it if you don't know anything about Basic? Nice interview, thanks. I do want to get this at some point, not sure when I will though. I took Visual Basic back in technical school. Until the very last week I tought I was the only person who did not understand. Your final required you to write a program that ran on all platforms available at that time; Win 95, 3.1, Dos,etc.. the upshot is, I was certain I was going to fail, however as it tuns out, I was the ONLY person who passed the class with flying colors. To boot, I actually wrote the code line for line rather than using the available visual references and buttons, grphics etc. it just seemed more logical and easy to understand at that time for me. I realize there are differences between Vis Basic and regular Basic, but I'm excited to explore those. Readers who tried Wareioware D.I.Y and found learning those game-making tools confusing will absolutely hate this Basic program. Those of you lazy about the proper use English language are going to have a tough time, I claim ot be no expert, these are just what I found. Basic is NOT forgiving and does not accept ebonics, not even 1 single key of being out of step. One keystroke incorrectly placed and you'll be pouring over hundreds of lines of code to find that single character that is not there. That is only possible fi you understand how it SHOULD look in the first place. Now you know that advantage, all those helpful people you called 'grammer nazi's' (on the net) have over you. There are advantages to learning to do some things the right way, the first time through. Don't get me wrong, Basic is a great program but make no mistake about it, this will seperate the men from the boys, the dreamers, from those who have true drive commitment. And what is this about translations? We didn't need no silly translations back in the '80s. Spoiled kids these days. Just start with 'Hello World' and go from there. Every time you learn something new (be it from seeing others' code or from your own mistakes), you can use it to make new fun things. Once you figure out some graphics and sound there is just so much to combine and try. And I'm sure today's (3)DS has much more to explore than those old C64s and Ataris and PCs. Still trying to find a really good tutorial in SMILE BASIC... none that I know of are in ENGLISH with no TRANSLATION boo boos....THE one i did find I had to translate page by page and was a bit hard to read due to translation problems. Best downloadable app available for DSi/3DS. @Kimiko I was showing my class that code.org intro to programming video and Facebook founder Mark Zuckerberg is saying, "try something out and if it doesn't work look it up on the internet". So, so different now. I remember pouring over books in the library that were hopelessly dated and unable to teach this preteen what peek and poke could do or why. Still, I went a long way with the basics of BASIC.